Abstract. Previously, it was found that patients with necrotizing crescentic glomerulonephritis (NCGN) and anti-neutrophil cytoplasmic autoantibodies (ANCA) directed against proteinase 3 (anti-PR3) had a faster deterioration of renal function and more active renal vasculitic lesions than patients with ANCA directed against myeloperoxidase (anti-MPO). Because ANCA-mediated neutrophil activation is thought to play an important role in the pathophysiology of this form of glomerulonephritis, this study was conducted to determine whether anti-PR3 are capable of inducing a more pronounced activation of neutrophils in vitro than anti-MPO. To test this hypothesis, the release of reactive oxygen radicals, as assessed by ferricytochrome c reduction and by dihydrorhodamine 123 oxidation, and the release of granule constituents from healthy donor neutrophils upon stimulation with IgG fractions were measured from 17 anti-PR3- and 14 anti-MPO-positive patients with active NCGN. Patients with anti-PR3 had a higher renal activity index (P < 0.05) compared with patients with anti-MPO. IgG fractions from anti-PR3-positive patients induced more oxygen radical release from tumor necrosis factor-α-primed neutrophils compared with IgG fractions from anti-MPO-positive patients, as assessed by ferricytochrome c reduction (P < 0.05) and dihydrorhodamine 123 oxidation (P < 0.01). In addition, IgG fractions from anti-PR3-positive patients generated more neutrophil degranulation of β-glucuronidase (P < 0.01) than IgG fractions from anti-MPO-positive patients. In conclusion, IgG fractions from anti-PR3-positive patients with NCGN are more potent activators of the respiratory burst and degranulation in vitro than IgG fractions from anti-MPO-positive patients. These observations may be relevant in view of the clinical differences between anti-PR3- and anti-MPO-positive patients with NCGN. Pauci-immune necrotizing crescentic glomerulonephritis (NCGN) occurs as part of systemic vasculitides such as Wegener's granulomatosis and microscopic polyangiitis, or as idiopathic NCGN without extrarenal manifestations of vasculitis. Almost all patients with pauci-immune NCGN are positive for anti-neutrophil cytoplasmic autoantibodies (ANCA) (1,2). These ANCA are directed against either proteinase 3 (PR3) or myeloperoxidase (MPO) (1,2). Significant differences in clinical presentation have been found between patients with anti-PR3 and anti-MPO ANCA. Patients with anti-PR3-associated vasculitis have been shown to present with more extensive extrarenal organ involvement than patients with anti-MPO-associated vasculitis (3,4,5,6). In addition, anti-PR3-positive patients with NCGN showed a faster deterioration of renal function before the start of immunosuppressive treatment than anti-MPO-positive patients with NCGN (3). This finding was associated with more active and less chronic renal lesions in patients with anti-PR3 compared to patients with anti-MPO ANCA (3). Neutrophils are important effector cells of tissue damage in ANCA-associated vasculitis and NCGN (7). Activated neutrophils, releasing lytic enzymes and oxygen radicals, are present in affected glomeruli and in the renal interstitium of patients with ANCA-associated NCGN (8). The number of activated intraglomerular neutrophils correlates with the severity of renal tissue damage as reflected in serum creatinine levels (8). Several studies have shown that ANCA are capable of activating neutrophils in vitro. Both anti-PR3 and anti-MPO can activate tumor necrosis factor-α (TNF-α)-primed neutrophils, leading to the production of reactive oxygen metabolites and the release of lysosomal enzymes, including the ANCA antigens themselves (8,9,10,11,12). In addition, ANCA can stimulate neutrophil cytotoxicity toward activated endothelial cells in culture (13,14). These in vitro studies support the hypothesis that ANCA-mediated neutrophil activation plays an important role in the pathophysiology of tissue damage in patents with ANCA-associated vasculitis and/or NCGN (15,16). Until now, no studies have been published that have systematically compared the neutrophil-activating capacity of IgG fractions from consecutive anti-PR3- and anti-MPO-positive patients with ANCA-associated vasculitis or NCGN. Because of the observed differences in clinical and histopathologic disease activity, we questioned whether IgG fractions from anti-PR3-positive patients are capable of inducing a more pronounced activation of neutrophils in vitro than IgG fractions from anti-MPO-positive patients. Therefore, we measured the superoxide production and the release of granule constituents from healthy donor neutrophils upon stimulation with IgG fractions isolated from anti-PR3- and anti-MPO-positive patients with active NCGN. In addition, we evaluated whether the capacity of the IgG fractions to activate neutrophils was related to clinical, laboratory, or histopathologic parameters of vasculitic disease activity. All consecutive patients who were newly diagnosed at our hospital between May 1990 and December 1997 with anti-PR3- or anti-MPO-associated pauci-immune NCGN were considered for participation in the study. Criteria included a diagnosis of pauci-immune NCGN, based on a renal biopsy showing focal or diffuse segmental crescentic necrotizing glomerulonephritis, and absence or paucity of immune deposits by immunofluorescence studies (2). In addition, plasma samples had to be available that were obtained during active NCGN before the start of immunosuppressive treatment and/or plasma exchange. For each patient, clinical and histopathologic characteristics were prospectively collected using a standardized protocol. Extrarenal vasculitic disease was categorized as follows (17). Ear, nose, and/or throat: nasal mucosal ulceration, serous otitis media, sinusitis, tracheal stenosis; Lung: pulmonary infiltrates, coin lesions, alveolar hemorrhage; Skin: palpable purpura, ulcers, or nodules; Nervous system: mononeuritis multiplex, peripheral neuropathy; Musculoskeletal tract: arthralgia, arthritis, polymyalgia; Eyes: (epi)scleritis, keratitis, uveitis, retinal vasculitis; Heart: pericarditis, myocardial infarction, cardiomyopathy; Gastrointestinal tract: bowel perforation, aneurysms by abdominal angiography. The Birmingham vasculitis activity score at the time of plasma collection for the isolation of the IgG fraction was retrospectively calculated (18). The score could range from 0 to 63. The control group consisted of 16 healthy volunteers, eight men and eight women, ages 22 to 48 yr (median, 34 yr). All kidney biopsies were evaluated by the same pathologist (Dr. Tiebosch), who was unaware of the ANCA specificity. Numbers of normal glomeruli and numbers of glomeruli with global sclerosis were counted. Percentages of glomeruli with necrosis and cellular and fibrous crescents were calculated by dividing the number of affected glomeruli by the total number of nonsclerosed glomeruli. Glomerular leukocyte influx and interstitial lesions, such as interstitial inflammation, interstitial fibrosis, and tubular atrophy, were graded semiquantitatively on a scale of 0 to 3 (absent, mild, moderate, and severe, respectively). In addition, each biopsy was scored according to an activity and chronicity index as reported previously (19). The maximal possible scores for the activity index and the chronicity index were 24 and 18, respectively. Plasma samples were obtained from freshly drawn blood and stored at -20°C until isolation of IgG. Purified IgG fractions were prepared using a protein G column (Mab Trap G II; Pharmacia Biotech, Uppsala, Sweden). Before their use in the activation experiments, the IgG fractions were centrifuged in an Eppendorf centrifuge for 15 min at 14,000 × g to remove aggregates that might be present. None of the IgG fractions contained endotoxin as determined by the limulus amoebocyte assay (Coatest, Endosafe, Charleston, SC). IgG fractions were tested for ANCA by indirect immunofluorescence (IIF) as described previously (20). IgG fractions were serially diluted from 1:20 to 1:640. Two observers independently read the slides. IgG fractions were tested for the presence of anti-PR3, anti-MPO, and anti-elastase antibodies by enzyme-linked immunosorbent assay as described previously (2). All experiments were performed twice using two different neutrophil donors. The first neutrophil donor was a 45-yr-old healthy male volunteer. The second neutrophil donor was a 25-yr-old healthy female volunteer. Peripheral blood was collected from these donors into a Vacutainer tube containing 0.34 M ethylenediaminetetra-acetic acid (EDTA) as anticoagulant. Peripheral blood was diluted 1:1 in NaCl 0.9%, and polymorphonuclear granulocytes were isolated by density gradient centrifugation (1000 × g for 20 min) on a Lymphoprep density gradient (Nycomed Pharma, Oslo, Norway). Contaminating erythrocytes were lysed with erythrocyte lysing buffer (155 mM NH4Cl, 10 mM KHCO3, and 0.1 mM Na2EDTA · H2O) for 5 min on ice. Next, cells were centrifuged at 600 × g for 5 min. This step was repeated once. Cells were then washed twice in ice-cold phosphate-buffered saline, pH 7.4, and pelleted at 200 × g for 10 min. Finally, the neutrophils were suspended in Hanks' balanced salt solution (Life Technologies, Paisley, Scotland, United Kingdom) containing calcium and magnesium. Before the activation experiments, the neutrophils were gradually warmed to 37°C. All buffers and media used in the isolation procedure contained less than 5 pg/ml endotoxin as determined by the limulus amoebocyte assay. To ascertain expression of PR3 and MPO on the neutrophil surface (9,10), neutrophils (1 × 106/ml) were primed with 10 ng/ml recombinant human TNF-α (Boeringher Ingelheim, Heidelberg, Germany) for 15 min at 37°C. Before the activation experiments, the neutrophils were treated with 5 μg/ml cytochalasin B (Serva, Heidelberg, Germany) for 5 min at 37°C. Superoxide release by neutrophils was determined by measuring the superoxide dismutase (SOD)-inhibitable reduction of ferricytochrome c according to the method of Pick and Mizel (21) with minor modifications (22). In short, freshly isolated primed neutrophils at a final concentration of 0.8 × 106/ml were incubated in 96-well microtiter plates (F-form; Greiner BV, Alphen aan den Rijn, The Netherlands) with ferricytochrome c (C7752; Sigma Chemical Co., St. Louis, MO) at a final concentration of 0.856 mg/ml, either with SOD (S9636; Sigma Chemical Co.) at a final concentration of 13.16 U/ml or with an equal volume Hanks' balanced salt solution, and stimulus. As stimulus, we used the purified IgG fractions at a final concentration of 200 μg/ml. N-formylmethionylleucylphenylalanine (fMLP; F3506, Sigma Chemical Co., final concentration 0.67 μmol/L) served as a positive control stimulus. The plates were incubated at 37°C for a total period of 120 min. During these 120 min, the plates were scanned repetitively at 550 nm using an automated microplate reader (Thermomax; Molecular Devices, Menlo Park, CA). Between the readings, the plates were kept at 37°C. The superoxide production was expressed as the difference in optical density (OD) 550 nm (ΔOD 550) between the ferricytochrome c reduction test in the absence and in the presence of SOD. Each test was performed in quadruplicate. Mean values are reported. The release of reactive oxygen radicals by neutrophils was additionally determined by measuring the oxidation of dihydrorhodamine 123 to rhodamine (23). Freshly isolated primed healthy donor neutrophils (final concentration 0.8 × 106/ml) were placed in 96-well plates (flat-bottom polystyrene Black Cliniplate; Labsystems Oy, Helsinki, Finland) with IgG fractions (final concentration 400 μg/ml) or with fMLP (final concentration 1.34 μmol/L) as stimulus and with DHR (D632; Molecular Probes, Eugene, OR) at a final concentration of 0.16 mmol/L. During the following incubation period of 120 min at 37°C, rhodamine production was measured fluorometrically (excitation and emission wavelength 485 and 538 nm, respectively) by repetitive scanning using a fluorimeter (Titertek Multiscan; Eflab Oy, Helsinki, Finland). Results are expressed as fluorescence units (U). Each test was performed in triplicate. Mean values are reported. Freshly isolated primed healthy donor neutrophils (final concentration 0.8 × 106/ml) were incubated in a 96-well microtiter plate (U-form, Greiner) with the IgG fractions (final concentration 400 μg/ml) or fMLP (final concentration 1.34 μmol/L) for 120 min at 37°C. At the end of this incubation period, cell-free supernatants were collected for the determination of β-glucuronidase and lactoferrin. β-Glucuronidase activity of the supernatant was assessed by the cleavage of P-nitrophenolate from P-nitrophenyl-β-glucuronide (Sigma, N1627), which can be measured spectrophotometrically at a wavelength of 405 nm (24). The assay was performed using 96-well microtiter plates (Greiner, F-form). Each well contained 50 μl of a 0.01 M solution of P-nitrophenyl-β-glucuronide in 0.1 M NaAC, pH 4.0, which was mixed with 50 μl of the cell-free supernatant. After an 18-h incubation period in the dark at 37°C, the reaction was stopped by adding 100 μl of a 0.4 M solution of glycine buffer, pH 10, to each well. Finally, the plates were scanned at 405 nm with a microtiter plate reader. Nonstimulated primed neutrophils provided a baseline, whereas the total neutrophil β-glucuronidase content was obtained by incubating the same amount of neutrophils with 1% Triton X-100 (Sigma). Results are expressed as percentage of the total β-glucuronidase content released per 8 × 105 cells/ml. The lactoferrin content of the supernatant was measured as described previously (25). Briefly, Hycult plates (Uden, The Netherlands) were coated with a F(ab′)2 rabbit anti-human lactoferrin polyclonal antibody (Jackson Laboratory, West Grove, PA) overnight at room temperature at a dilution of 1:750, then washed and incubated with serial (twofold) dilutions of the samples, starting at a dilution of 1:25, for 1 h at 37°C. After washing, a rabbit anti-human lactoferrin polyclonal antibody conjugated with horseradish peroxidase (Jackson) was incubated for 30 min at 37°C at a dilution of 1:500. Finally, O-phenylenediamine (Sigma) substrate was incubated for 15 min. The color reaction was stopped with 100 μl per well of 2N H2SO4. OD values were measured at 492 nm. The standard consisted of a supernatant from neutrophils activated with calcium ionophore and was in the range 0.8 to 100 ng/ml lactoferrin. Differences in age, laboratory parameters, number of affected extarenal organs, Birmingham vasculitis activity scores, renal biopsy characteristics, ΔOD 550 nm values at 120 min (ferricytochrome c reduction), fluorescence units at 120 min (dihydrorhodamine 123 oxidation), and the release of β-glucuronidase and lactoferrin between groups were tested with the Mann-Whitney U test. Differences in the male-to-female ratio and organ involvement between groups were tested with the χ2 test with Yates continuity correction. The level of significance used was 0.05. All reported P values are two-sided. The normal range of the test results was considered to be the mean ± 2 SD from the healthy control group. Correlations between parameters were tested with the Spearman rank test. IgG fractions were obtained from 17 anti-PR3- and 14 anti-MPO-positive patients with NCGN and from 16 healthy control subjects. Table 1 lists the individual demographic and clinical characteristics of the patients at the time of plasma sample collection for isolation of the IgG fraction. Table 2 shows the demographic and clinical characteristics by antibody specificity. There were no significant differences in age, male-to-female ratio, serum creatinine, and C-reactive protein levels between patients with anti-PR3 and those with anti-MPO ANCA. The Birmingham vasculitis activity scores were higher in patients with anti-PR3 compared with patients with anti-MPO ANCA (P = 0.029). Table 3 lists the organ involvement at diagnosis by autoantibody group. The mean ± SD number of affected extrarenal organs in the anti-PR3 group exceeded that of the anti-MPO group (3.0 ± 1.2 and 1.9 ± 1.3, respectively; P = 0.03). Table 4 shows the renal biopsy characteristics by autoantibody group. Patients with anti-PR3 tended to have a higher degree of glomerular leukocyte influx (P = 0.07) and a higher percentage of glomeruli with necrosis (P = 0.07) compared to patients with anti-MPO. Anti-PR3-positive patients had a higher renal activity index (P = 0.04) than anti-MPO-positive patients. The renal chronicity index did not differ significantly between both antibody groups. The IgG concentration in the IgG fractions from anti-PR3- and anti-MPO-positive patients was comparable (median IgG concentration [range]: 8.1 mg/ml [4.0 to 12.2] and 8.2 mg/ml [4.0 to 12.5]; NS). IIF titers of the IgG fractions (tested at 4 mg/ml) did not differ significantly between patients with anti-PR3 and those with anti-MPO (median IIF titer [range]: 80 [40 to >640] and 160 [40 to >640], respectively; NS). IgG fractions from the patients with anti-PR3 did not contain anti-MPO and/or anti-elastase, and IgG fractions from the patients with anti-MPO did not contain anti-PR3 and/or anti-elastase as determined by enzyme-linked immunosorbent assay. None of the IgG fractions from healthy control subjects contained anti-PR3, anti-MPO, or anti-elastase. Figure 1A shows the results of the ferricytochrome c reduction test, using primed healthy donor neutrophils. fMLP induced more superoxide release compared with IgG fractions from either healthy control subjects or from ANCA-positive patients. In addition, the fMLP-induced superoxide release followed a different time course than the IgG-induced superoxide release. Superoxide release upon stimulation with fMLP was most pronounced in the first 30 min and leveled off thereafter, whereas IgG fractions from healthy control subjects and ANCA-positive patients induced a gradual release of superoxide over time. The results obtained with the two different neutrophil donors were comparable. Superoxide release upon stimulation with IgG fractions from healthy control subjects and from anti-MPO-positive patients did not differ (first and second neutrophil donor, P = 0.79 and P = 0.16, respectively). In contrast, IgG fractions from anti-PR3-positive patients elicited significantly more superoxide release compared with IgG fractions from healthy control subjects (P < 0.05 for both neutrophil donors) or IgG fractions from anti-MPO-positive patients (first and second neutrophil donor, P < 0.05 and P < 0.01, respectively). The superoxide release after 120 min did not differ significantly between the anti-PR3 and anti-MPO group when corrected for the difference in renal activity index between both antibody groups. (A) Superoxide release measured by ferricytochrome c reduction using tumor necrosis factor-α (TNF-α)-primed neutrophils from the first (left panel) and second (right panel) healthy neutrophil donor. Neutrophils were stimulated with IgG fractions from anti-proteinase 3 (anti-PR3) ANCA-positive patients (▪, n = 17), IgG fractions from anti-myeloperoxidase (anti-MPO) ANCA-positive patients (▴, n = 14), or IgG fractions from healthy control subjects ([UNK], n = 16). Presented are mean values ± SEM. The dashed line indicates the superoxide production induced by N-formylmethionylleucylphenylalanine (fMLP). 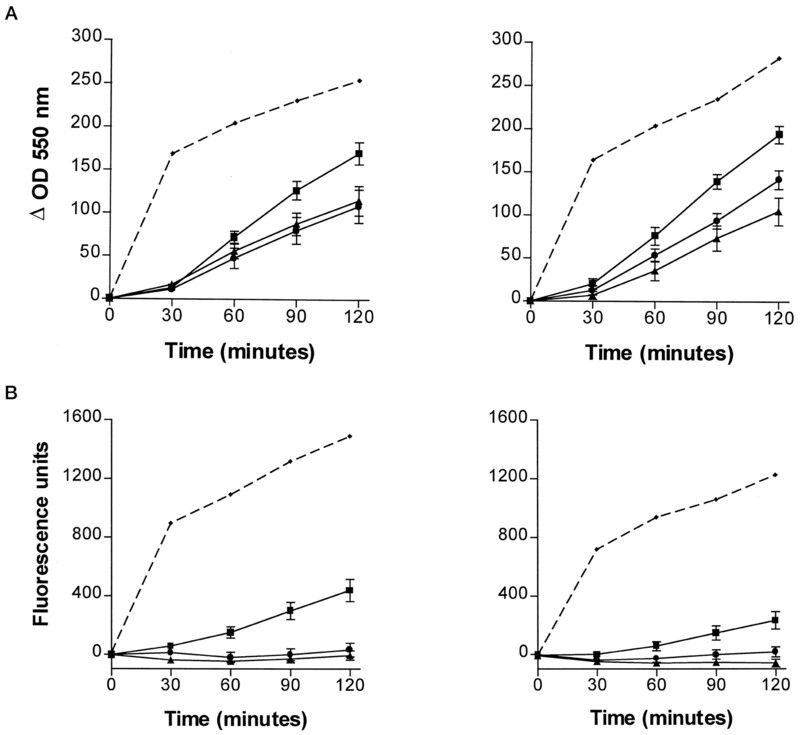 (B) Oxygen radical release measured by oxidation of dihydrorhodamine 123 to rhodamine using TNF-α-primed neutrophils from the first (left panel) and second (right panel) healthy neutrophil donor. Neutrophils were stimulated with IgG fractions from anti-PR3 ANCA-positive patients (▪, n = 17), IgG fractions from anti-MPO ANCA-positive patients (▴, n = 14), or IgG fractions from healthy control subjects ([UNK], n = 16). Presented are mean values ± SEM. The dashed line indicates the superoxide production induced by fMLP. Using neutrophils from the first neutrophil donor, nine of the 17 IgG fractions from anti-PR3 (53%) and three of the 14 IgG fractions from anti-MPO-positive patients (21%) induced more superoxide release than the mean superoxide production + 2 SD induced by IgG fractions from healthy control subjects. Using neutrophils from the second neutrophil donor, nine of the 17 IgG fractions from anti-PR3 (53%) and two of the 14 IgG fractions from anti-MPO-positive patients (29%) induced more superoxide release than the mean superoxide production + 2 SD induced by IgG fractions from healthy control subjects. Results of the dihydrorhodamine oxidation test using primed donor neutrophils are presented in Figure 1B. The results obtained with the two different neutrophil donors were comparable. IgG fractions from healthy control subjects and from anti-MPO-positive patients did not induce any measurable rhodamine production. In contrast, anti-PR3-positive IgG elicited more rhodamine production compared with healthy control IgG fractions (first and second neutrophil donor, P < 0.0001 and P < 0.01, respectively) or anti-MPO-positive IgG fractions (first and second neutrophil donors, P < 0.0001 and P < 0.01, respectively). Notably, the amount of rhodamine produced upon stimulation with IgG fractions from anti-PR3-positive patients was modest compared with the effect of fMLP. Results of the β-glucuronidase degranulation assay using TNF-α-primed donor neutrophils are shown in Figure 2 and Table 5. The results obtained with neutrophils from the two different neutrophil donors were comparable. IgG fractions from anti-PR3 ANCA-positive patients induced more β-glucuronidase release than IgG fractions from either healthy control subjects or anti-MPO ANCA-positive patients. β-Glucuronidase release upon stimulation with IgG fractions from anti-PR3 (▪, n = 17)- and anti-MPO ANCA-positive patients (▴, n = 14) and IgG from healthy control subjects ([UNK], n = 16) using TNF-α-primed neutrophils from the first neutrophil donor. As shown in Table 5, IgG fractions from anti-PR3-positive patients induced more lactoferrin release compared with IgG fractions from healthy control subjects. This was true for both neutrophil donors. Using neutrophils from the first donor, lactoferrin release was higher upon stimulation with IgG fractions from anti-MPO-positive patients compared with IgG fractions from healthy control subjects, but the difference did not reach statistical significance (P = 0.10). Using neutrophils from the first neutrophil donor, lactoferrin release was comparable for IgG fractions from anti-PR3- and anti-MPO-positive patients (P = 0.33). Using neutrophils from the second neutrophil donor, IgG fractions from anti-PR3-positive patients induced more lactoferrin release compared with IgG fractions from anti-MPO-positive patients (P < 0.01). Table 6 and Figure 3 show correlations between the capacity of the IgG fractions from ANCA-positive patients to induce superoxide release, expressed as the ΔOD 550 nm at 120 min in the ferricytochrome c reduction test (using neutrophils from the first neutrophil donor), and parameters of vasculitic disease activity in these patients. For the whole group of ANCA-positive patients (anti-PR3 and anti-MPO; n = 31), there was no significant correlation between the capacity of the IgG fractions to induce superoxide release and the number of affected organs, the Birmingham vasculitis activity scores, serum creatinine levels, or C-reactive protein levels. For the whole group (n = 31) and for the anti-MPO-positive patient group (n = 14), the neutrophil-activating capacity of the IgG fractions correlated with the ANCA titer in the IgG fractions. The capacity of the IgG fractions to induce superoxide release correlated with the percentage of glomeruli with cellular crescents (r = 0.42; P = 0.03) and with the percentage of glomeruli with necrosis (r = 0.53; P = 0.005) and tended to correlate with the extent of glomerular leukocyte influx (r = 0.36; P = 0.07). Accordingly, the neutrophil activating capacity of the IgG fractions correlated with the renal activity index (r = 0.47; P = 0.02). In addition, there was an inverse correlation between the capacity of the IgG fractions to elicit superoxide release and the percentage of glomeruli with fibrous crescents (r = -0.61; P = 0.0009), the extent of interstitial fibrosis (r = -0.57; P = 0.002), and the extent of tubular atrophy (r = -0.46; P = 0.02). In line with these findings, the capacity of the IgG fractions to induce superoxide release correlated inversely with the renal chronicity index (r = -0.59; P = 0.002) in these patients. Relationship between the capacity of the ANCA-positive IgG fractions to induce superoxide release, expressed as ΔOD 550 nm at 120 min in the ferricytochrome c reduction test (using neutrophils from the first neutrophil donor), and the renal activity index (left panel) and renal chronicity index (right panel) in anti-PR3 ANCA-positive patients (▪, n = 17) and anti-MPO ANCA-positive patients (▵, n = 14). See Table 6 for Spearman rank correlations and statistical significance. For anti-MPO-positive patients, there was a comparable positive correlation between the capacity of the IgG fractions to induce superoxide release and the percentage of glomeruli with necrosis (r = 0.75; P = 0.003) and with the renal activity index (r = 0.56; P = 0.049) (Figure 3), as well as a comparable inverse correlation with the extent of interstitial fibrosis (r = -0.79; P = 0.001), the extent of tubular atrophy (r = -0.61; P = 0.03), and the renal chronicity index (r = -0.87; P = 0.0001) (Figure 3). For anti-PR3-positive patients, the capacity of the IgG fractions to induce superoxide release did not correlate significantly with any of the renal biopsy characteristics. The present study shows that IgG fractions from anti-PR3-positive patients with NCGN are more potent in inducing the respiratory burst and degranulation of healthy donor neutrophils in vitro than IgG fractions from anti-MPO-positive patients with NCGN. Several studies have shown that anti-PR3 and anti-MPO ANCA can activate TNF-α-primed neutrophils leading to the production and release of reactive oxygen radicals and the release of lysosomal enzymes (8,9,10,11,12). In these studies, patient selection criteria differed widely and IgG fractions from a relatively small number of patients were tested. This is the first study that has systematically compared the in vitro neutrophil-activating capacity of anti-PR3 and anti-MPO ANCA from a relatively large group of consecutive patients with ANCA-associated NCGN. We found that most, but not all, anti-PR3-positive IgG fractions from patients with active NCGN were capable of inducing the respiratory burst and degranulation of healthy donor neutrophils in vitro. In contrast, only a minority of anti-MPO-positive IgG fractions from patients with active NCGN induced the respiratory burst or degranulation to an extent greater than that observed with IgG fractions from healthy control subjects. These observations may be relevant in view of the clinical and histopathologic differences between anti-PR3 and anti-MPO ANCA-positive patients with NCGN that we and others have found, such as a faster deterioration of pretreatment renal function and more active renal lesions (including necrosis and cellular crescents) in patients with anti-PR3, and more chronic renal lesions such as sclerosis and fibrosis in patients with anti-MPO ANCA (3,4,5,6). Also in the present study, we found that renal biopsies from patients with anti-PR3 ANCA-associated NCGN had a higher renal activity index compared to patients with anti-MPO ANCA-associated NCGN. The mechanisms involved in ANCA-mediated neutrophil activation are not fully clarified. Upon priming, PR3 and MPO translocate from the cytoplasmic granules to the extracellular membrane, where these antigens become available for interaction with anti-PR3 and anti-MPO ANCA (9,10). ANCA probably interact with neutrophils by recognizing and binding PR3 or MPO through the Fab portion of the Ig molecule (26). The actual activation of neutrophils by ANCA is subsequently largely mediated by FcγRIIa receptors (12,27,28). In some studies, however, F(ab′)2 fragments of the ANCA antibodies also induced neutrophil activation, suggesting that FcγRIIa-independent processes may be involved as well (9,11,26). In the present study, we found that IgG fractions from anti-PR3 and anti-MPO-positive patients differ in their capacity to activate neutrophils in vitro. IgG fractions from anti-PR3 and anti-MPO-positive patients had similar titers of ANCA. However, it is important to note that the specific activity of each type of antibody in the IgG preparations is not known. There are several possible explanations for the observed differences in neutrophil-activating capacity by IgG fractions from anti-PR3- and anti-MPO-positive patients. The receptor engagement by ANCA might differ because of a quantitative difference between anti-PR3 and anti-MPO in the IgG preparations. Another explanation may be that receptor engagement by anti-PR3 and anti-MPO differs due to differences in IgG subclass distribution and/or affinities of anti-PR3 and anti-MPO for their respective antigens. Alternatively, anti-PR3- and anti-MPO-mediated neutrophil stimulation may use different signal transduction routes. Finally, quantitative differences in the expression of PR3 and MPO on the neutrophil surface (29) may result in a divergent availability of interaction sites for anti-PR3 and anti-MPO, respectively. We found no significant correlation between the in vitro capacity of the IgG fractions to induce neutrophil superoxide release and parameters of vasculitic disease activity such as serum creatinine levels, C-reactive protein levels, and Birmingham vasculitis activity scores. Previously, we also found no significant correlation between the in vitro capacity to activate neutrophils and the number of H2O2-producing neutrophils present within the glomeruli (8). In the present study, however, we found that the capacity of the IgG fractions to induce superoxide release was positively correlated with the severity of active lesions, such as the proportion of glomeruli with necrosis. Interestingly, we also found an inverse relation between the neutrophil-activating capacity of the IgG fractions and the extent of subacute or chronic renal lesions, such as the proportion of glomeruli with fibrous crescents and the severity of interstitial fibrosis and tubular atrophy in these patients. This indicates that patients with predominantly active renal lesions had ANCA with a higher capacity to activate neutrophils in vitro, whereas patients with predominantly chronic renal lesions had ANCA with a lower capacity to activate neutrophils in vitro. However, the relation between the capacity of the IgG fractions to induce superoxide release and certain renal histopathologic characteristics was found only in the total ANCA-positive patient group (both anti-PR3 and anti-MPO) and in the anti-MPO-positive patient group, but not in the anti-PR3-positive patient group alone. Therefore, other factors besides ANCA-mediated neutrophil activation are probably important for the in vivo outcome. Thus, extrapolation of in vitro results to the in vivo situation must be done with great caution. In vivo, cytokines and other factors are present, which may influence neutrophil chemotaxis and activation. Indeed, ANCA-induced production of oxygen radicals in vitro was markedly enhanced in the presence of extracellular arachidonic acid (30). 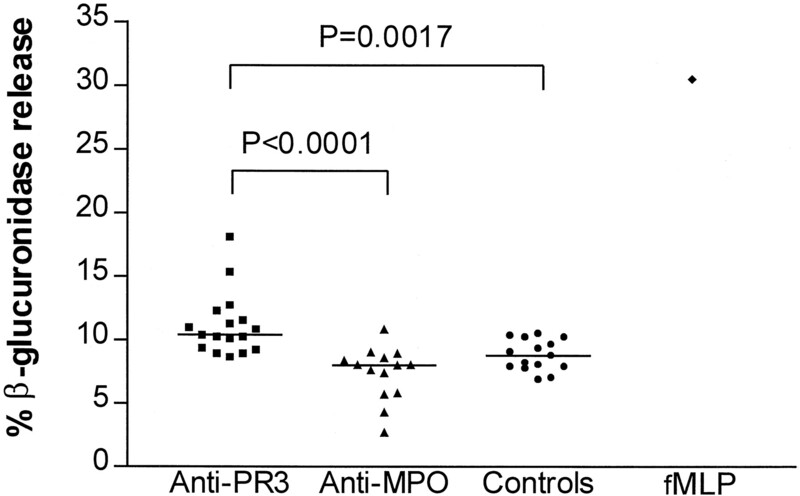 In conclusion, anti-PR3 are more potent in activating neutrophils than anti-MPO. We propose that this finding may partly explain the clinical and histopathologic differences found in patients with anti-PR3 ANCA compared to patients with anti-MPO ANCA. This study was supported by Grant C94-1434 from the Dutch Kidney Foundation. W. J. Sluiter is acknowledged for his statistical advice.